Description: Sexes similar. Black head, neck, and breast. 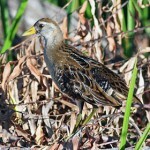 Back and wings are dark brownish-olive. Bright red forehead shield, and red bill with yellow tip. Conspicuous white line along flanks and white undertail coverts. Long greenish legs and toes. Juveniles lighter in color and lack bright red forehead shield. 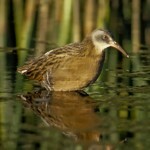 Habitat: Freshwater habitats with abundant emergent vegetation. 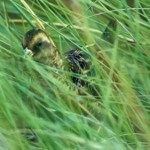 Where in Nebraska: Occasional migrant and rare summer resident in eastern Nebraska. Rare breeding reports since 1984. Fun Facts: Newly hatched chicks of the Common Moorhen have spurs on their wings that help them climb into the nest or grab emergent vegetation. 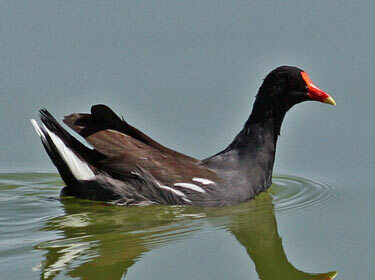 Additional Information: Sometimes referred to as Common Gallinule.